Home › What Is A Degree? According to Wikipedia, an academic degree is a college or university diploma, often associated with a title and sometimes associated with an academic position. This reward is usually in recognition of a student who successfully completed a course of study. The most common degrees awarded today are Associate’s, Bachelor’s, Master’s, and Doctoral degrees. Most higher education institutions generally offer certificates and several programs leading to advanced studies. Certificates and Diplomas: Programs usually last 1 or 2 years – if you study full-time. A certificate or diploma is not a degree. It does not meet the course or credit requirements of a degree. Still, there are many types of certificate programs particular to specific areas, some of which institutes design to supplement a degree. It just depends on the type of certificate, its scope and purpose. Many colleges also offer accredited programs that bear credits to a degree. Upon graduation, students may choose to continue their education and earning their bachelor’s degree during the next two years. Bachelor’s Degree: Taken full-time, most bachelor’s degree programs take four years to complete. Some programs (such as engineering) may take five to six years. Master’s Degree: The next step after a bachelor’s degree is a master’s degree in a specific academic discipline. Programs normally last 18 months to 2 years – although some institutes offer a combined bachelors- and master’s-degree programs over five years. Increasingly, adults are earning their master’s degrees via distance learning, particularly in business (MBA), psychology, religion, and education. Doctoral Degree: The top of the educational ladder is the Ph.D or doctorate. The period tends to be flexible, because most doctoral candidates are working adults. Programs generally require a major research thesis that may take several years to complete. Continuing education programmes: These individual courses are typically for working adults. Classes may last only one night, or continue over several weeks. These classes do not lead to a degree or certificate. They are for enjoyment, to acquire specific knowledge, or to help the student advance in the workplace. Sometimes, credits from continuing education courses can count towards a degree, if the institution is accredited. You might wonder about the differences between a degree and a diploma. Here is some of the things that you should consider. 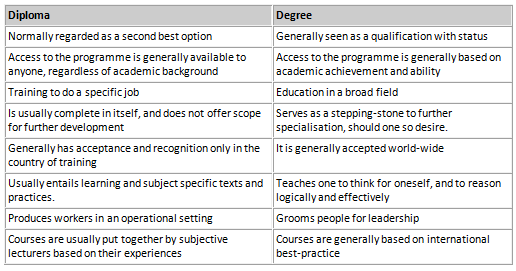 Although it might not be correct – this is what society perceive the qualifications to be.